The Nokia CK-15W features a 2.2 inch color screen and DSP circuitry for excellent audio quality. 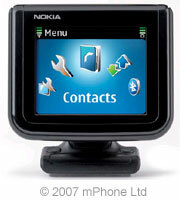 The little monitor displays caller's name and number, signal strength, operator name, power indication. Internal call registers: last dialed numbers, missed calls and received calls. Once paired with a compatible phone, the Nokia Bluetooth Display Car Kit CK-15W enables you to browse the contact list and make phone calls even with your phone is in your pocket. Best of all, it's seamless: the Nokia Bluetooth Display Car Kit CK-15W uses wireless Bluetooth technology to link up with your compatible mobile phone at the moment you turn the ignition key or press the hook key of the input device. UK based customers can buy the Nokia CK-15W with the installation service as well. Note that with the standard installation, the sound of the call will be played through an external speaker and the holder screws would be drilled into the dash-board. For a more elegant solution, see the Deluxe installation below or order the standard installation here. UK based customers can buy the Nokia CK-15W with the deluxe installation service as well. Audio Loom. This allows you to listen to the phone through the car stereo's speakers rather than the standard speaker provided with the Handsfree car kit. There are extra leads needed if the stereo has external amplification for example on a Bose system. Select this installation option for the Nokia CK-15W kit plus all additional equipment for Deluxe installation as well as the installation service. If you would like to add a leather-mount holder, see below.